Y’all. I found gluten free gnocchi at HEB. I think the last time I had gnocchi was at least six years ago. The existence of gluten free gnocchi might not be a giant revelation for the rest of the gluten free world, but this is the first time in at least a few years I’ve even thought to look for gluten free gnocchi in a store. So to me, this is huge. It was only three bucks for a package, and it was super convenient. 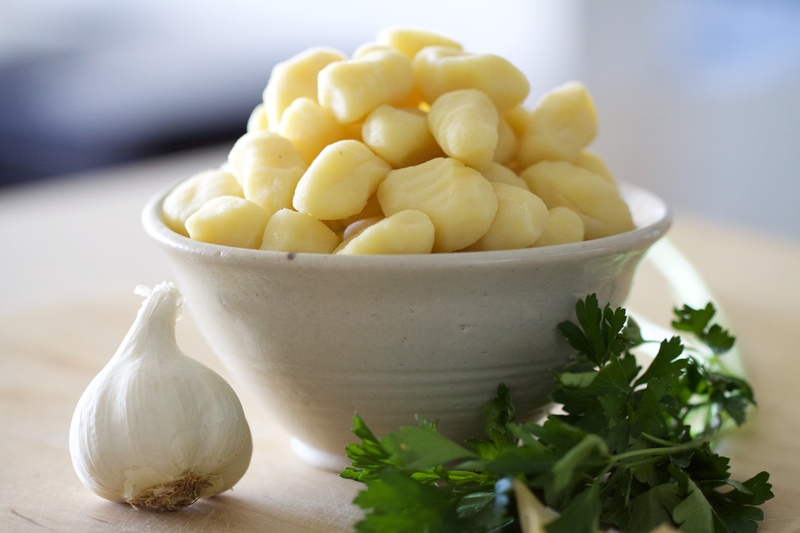 Just drop the gnocchi in boiling water, cook till they float, then crisp them up in a pan with butter and herbs. And they tasted really good. Maybe not as fluffy as the ones at the gluteny ones I made at the Beverly Hills Hotel back in the day, but still super satisfying. The only drawback to these particular gluten free gnocchi is they’re a little on the salty side. Seasoning a test run of herbed gnocchi with salt and pepper made them just this side of too salty, so when I made our pot roast dinner, I skipped the salt and just cracked some pepper on them. It’s a little chilly here in Austin, and I wanted something rich and hearty to go with my gnocchi. So I made a simple pot roast in my pressure cooker then reduced the resulting cooking liquid til it resembled a demi glace. The sauce is thickened entirely by reducing it. No flour or thickeners required. 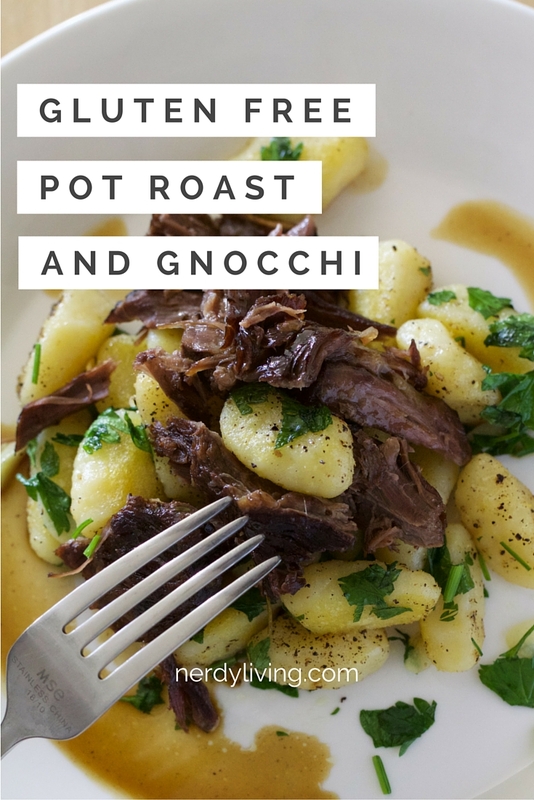 That means the pot roast just-so-happens-to-be gluten free, so if you don’t care about the gluten content of your dinner you can make this recipe with a regular pre-made gnocchi and no one will be the wiser. Speaking of that cooking liquid, I love a pot roast with red wine in it but Tony and I don’t drink so we never have wine on hand. I’ve been looking for a substitute that adds a similar depth of flavor and I think I’ve found one: unsweetened pomegranate juice. I’ve used other things like cherry juice and blackberry Izzie (don’t judge – I was feeling experimental) in other recipes where wine would be appropriate. I actually like both of those, but I thought they would have too much sweetness for this sauce since it gets reduced so much. While the sugar in the raw pomegranate juice is almost imperceptible, once it was cooked down to a glace it added just enough sweetness. Same way a good red wine might. Anyway, you could substitute red wine for the pomegranate juice if you have some on hand. No big deal. The last thing to note is that I used my pressure cooker to make the pot roast. You can absolutely do this in the oven, and probably in a slow cooker too, it will just take longer. With my pressure cooker I can have fork tender pot roast in about a hour. The same pot roast has taken me 4-6 hours in the oven. 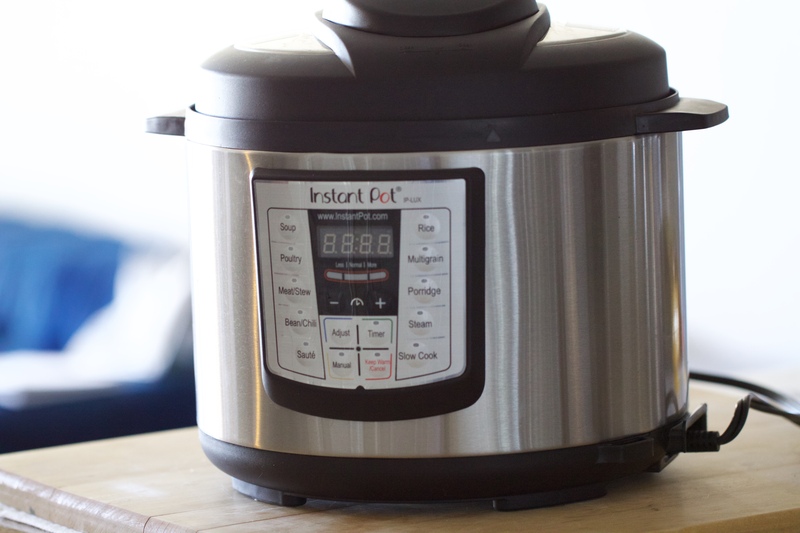 I use an electronic Instant Pot pressure cooker – it’s the same brand Michelle Tam uses over at Nom Nom Paleo – and it’s as easy to use as a slow cooker. Like a slow cooker, you just set it and forget it. No babysitting required. For a recipe like this, you just put all of the ingredients in the cooker, close the lid, set it, and forget it. The only drawback in this case is that there’s very little evaporation during the cooking process, so if you want to make a sauce from the cooking liquid it needs to be reduced on the stove. Small price to pay for pot roast in an hour. Put a seasoned chuck roast in the pressure cooker, add chicken stock and pomegranate juice to the pot, then add onion, carrots, bay leaves, rosemary, and thyme and cook in the pressure cooker for about an hour. After cooking, remove the chuck roast and strain the cooking liquid into a small pot. You may need to add more chicken stock and/or pom juice depending on how much cooking liquid you have. Simmer over low/medium heat until reduced by 3/4. Taste after 30 minutes and then every ten or fifteen minutes so you can stop reducing when the sauce tastes awesome. It took me about an hour to reduce my sauce. Don’t add salt until it’s done reducing otherwise you risk over-seasoning. 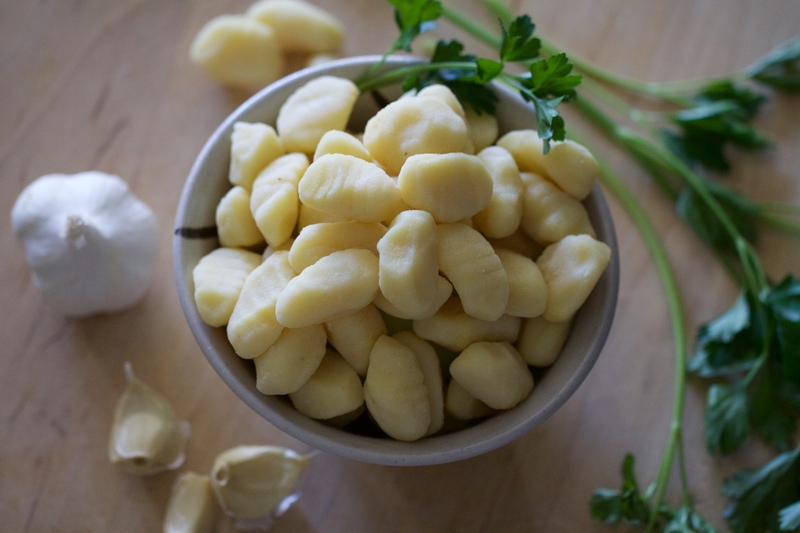 Boil the gnocchi for a couple of minutes then use a slotted spoon or strainer to remove them from the water and transfer to a heated pan with melted butter and garlic. Let the gnocchi cook undisturbed for a few minutes to crisp on one side, then toss to crisp on the other side. Crack fresh pepper over the gnocchi and toss with lots of fresh chopped parsley. Mound gnocchi on a plate, pile fork shredded pot roast on top, and spoon over the demi glace. 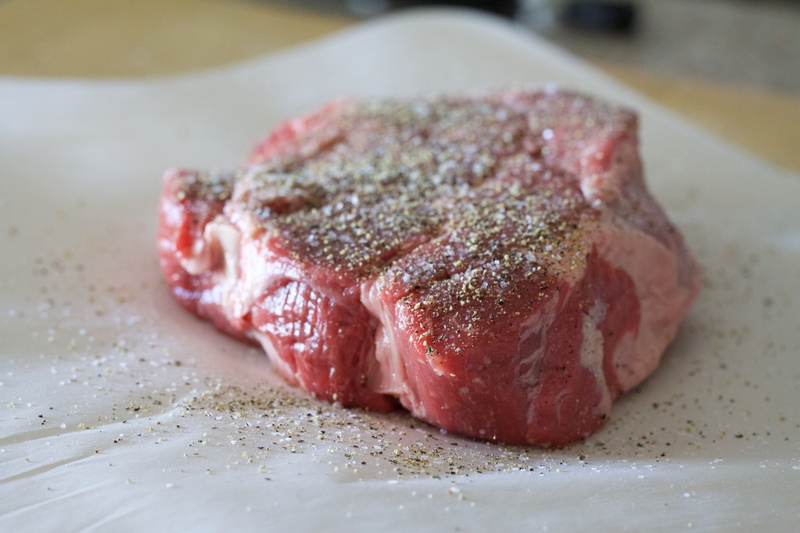 Season chuck roast with salt and pepper, then place into the bottom of the pressure cooker. Add the chicken stock and pomegranate juice to the pot, then nestle remaining ingredients in the pressure cooker next to the chuck roast. Close pressure cooker, and cook for about 1 hour on the "meat" setting. When the roast is done cooking follow your cooker's instructions for safe opening and pressure release, then remove the pot roast from the pressure cooker. Strain the resulting cooking liquid through a fine mesh sieve into a small pot. If you have less than 3 or 4 cups of liquid from the roast, add a half and half mix of chicken stock and pomegranate juice to bring the amount up to at least 3 cups. Bring to a simmer on the stove over medium/low heat. Gently reduce the liquid to about 1 cup, tasting frequently. My sauce took about one hour to reduce. When the sauce has reduced and thickened, taste and season with salt and pepper if necessary. When the sauce is about 20 or 30 minutes away from finished, start cooking the gnocchi. Follow the package instructions to cook the gluten free gnocchi in unsalted water. While the gnocchi is boiling, heat a pan (I used a large ceramic non-stick pan) over medium heat and add butter. When the butter is melted, add the garlic and cook gently until the garlic is blonde and fragrant, about 2 minutes. When the gluten free gnocchi floats in the boiling water (or when they're done according to your package directions) strain them and transfer them to the hot pan with butter and garlic. Leave gnocchi undisturbed to crisp on one side, about 5 minutes. When crispy on one side, toss them so they can crisp on the other side, another 5 minutes. Finish by adding the chopped herbs and tossing through. If adding woody herbs like thyme or rosemary, add those first and cook for a few minutes before adding any tender herbs like parsley. Cook for another minute or two. Mound the gluten free gnocchi on a plate. 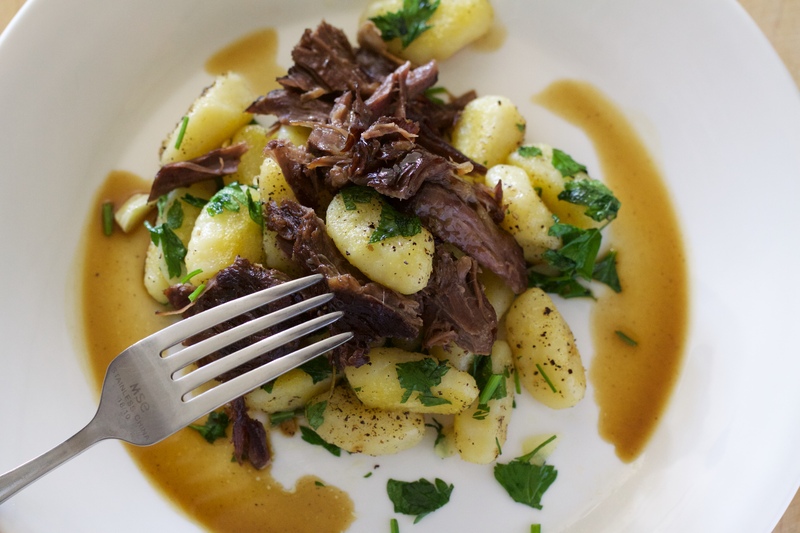 Shred the pot roast with a fork, then pile it on top of the gnocchi. Finish by spooning the sauce over the pot roast and gnocchi. Red wine can be substituted for the pomegranate juice if you have it. If your sauce becomes over reduced (too thick or intense tasting) but it's not burned, you can add plain chicken stock to thin it back out. If it burns though, there's no way to save it so keep an eye on that precious sauce! The pot roast part of this recipe doesn't require any special gluten free ingredients, and relies on the power of reduction to make the sauce thick. Because of that, it should be easy to swap out regular gnocchi for the gluten free gnocchi if you don't need to follow a gluten free diet. This recipe is gluten free, alcohol free, contains no refined or artificial sugars, and because of the kind of gnocchi I used, gum free. The pot roast is also paleo, and it would be easy to swap out the gnocchi for a different side like roasted carrots to make it entirely paleo friendly. Previous ArticleI’m in with the in crowd. Are you?